The low V.O.C. multi-step catalyzed finish and a rich, Asbury stain will add a sophisticated elegance to the table and to the room you'll place it in. Solid oak wood sustainably sourced and responsibly harvested from American forests is used for the table. This solid wood dining table and chairs set is Made in America. Made by a master craftsman, using methods handed down from father to son for, generations this collection will become a treasured heirloom within your family. Once the craftsmen have finished the labor intensive sandingit is given a rich lustrous stain to enhance the wood grain. 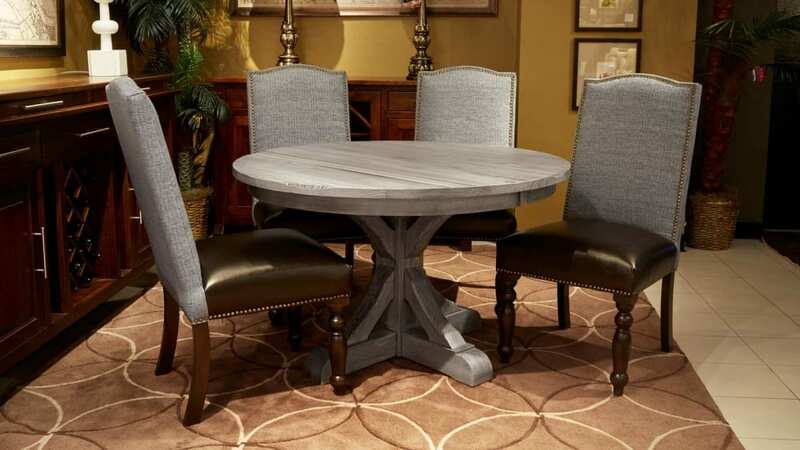 The Vanderbilt Side Chairs with the top grain leather seat and grey upholstered back with nail head trim are stylish comfortable and add a distinct cultured charm when paired with the settlers table.